Waste Pits under this containment cap are no more dangerous to the Public’s health, than if an attempt is made to excavate and remove the toxic waste, according to the new report by the US Army Corps of Engineers. Residents along the San Jacinto River, and environmental activists will be disappointed in a report issued Monday, Aug. 10th by the Army Corps of Engineers. 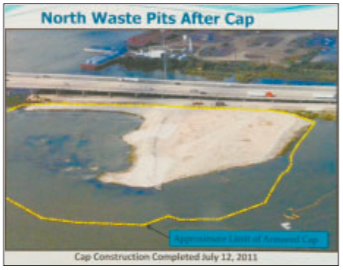 They were expecting the report to clearly indicate the need to remove the waste pits and toxins they contained, but instead the report was ambivalent at best, saying that dredging and removal posed as much of a risk to health as leaving the wastes under a secure, well maintained membrane cap. At the request of the U.S. Environmental Protection Agency, who are charged with cleaning up Superfund Sites, including the so-called Toxic Waste Pits in the San Jacinto River, the Corps conducted a thorough study of six varied remediation schemes ranging from containing and capping the site, to partial removal, to complete removal of the toxic materials. These toxic materials on the site include dioxins, and other carcinogens with the potential to affect human health. The toxins are contained in a sludge, or sediment that was deposited on the site, from barges filled with waste from paper mills, around 1965 and later. The EPA has identified Potential Responsible Parties as McGinnes Industrial Maintenance Corp., Waste Management, and International Paper. These so-called PRPs were responsible for constructing the current membrane and rock containment cap now over the waste site, and they have argued that this is all that is required to safely isolate the toxic wastes. However, the Harris County Attorney, Vince Ryan, and his assistant attorney Rock Owen, have sued the companies in court for damages and to clean up the site. They won a judgement against McGinnes and Waste Management for $29.4 million dollars, but International Paper was excluded from the settlement by a jury. The county is now appealing the ruling on this third company. La Porte, Texas – The Galveston Bay Foundation (GBF) and the Houston Advanced Research Center (HARC) today announced the first-ever Galveston Bay Report Card on the health of the Bay. This is the first time researchers have graded the Bays overall health, and some of the results are concerning. GBF spent a year gathering input from thousands of local residents and stakeholders to determine what people want to know about the health of Galveston Bay. As a result, HARC analyzed data and trends on the topics of Water Quality, Pollution Events & Sources, Wildlife, Habitat, Human Health Risks, and Coastal Change. The combined grade for all six categories is a C, which the report card describes as adequate for now. The Bays most significant challenges are pollution, declines in habitat acreage and some shellfish species, and the impacts of sea level rise. Some of the issues that have been identified are due to human activities that can be prevented. Others are more complex and will require cooperation and planning on both the local and regional levels. PASADENA, Texas — In an effort to continue to meet the demand of the region’s workforce, and to support students as they transition to four-year colleges and universities or directly enter the workforce, the San Jacinto College Board of Trustees unanimously voted to call for a bond referendum for the Nov. 2015 election. Voters within the San Jacinto College District will vote on the issuance of $425 million in general obligation bonds needed to prepare students to live and work in the community. Proposed projects include state-of-the-art facilities to train students and workers in the petrochemical, energy, engineering, computers, and technology sectors; a new welcome center providing a “one-stop shop” for student support services such as admission, financial aid, and counseling; new culinary and cosmetology facilities; and additional classroom facilities across the district. Nine buildings will be renovated – most of which are more than 30 years old – which will provide updated space for early college high school and dual credit programs, as well as more relevant, efficient, and technically updated instructional space for employees and students. Additionally, the funding will provide for security, access, and safety upgrades throughout all facilities and significant infrastructure upgrades and replacements for systems at the end of their useful life.